Posted Thursday, September 19th, 2013 by Steve Leigh. 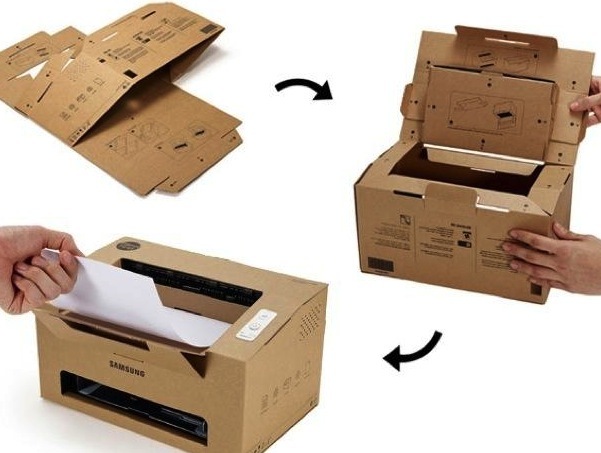 Have you ever wished you could fold up your printer and take it with you? 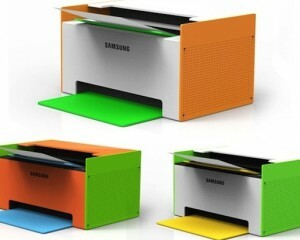 Well, Samsung has created a few concept printers that come pretty close to this goal, and they are quite impressive! The three printers were created for the 2013 International Design Excellence Awards, with a focus on eco-friendliness, simplicity, and customization. While they may not be headed to store shelves just yet, they breathe new life into printer design concepts, which have been fairly stagnant for years. They’ve also been busy creating the first NFC-equipped laser printers to hit the market. The first of the lineup is the Origami. The chassis of the printer is made of foldable cardboard that can go from flat to fully assembled in a few minutes. Of course, the printing unit itself is contained within the box, so don’t expect a lot of portability. Instead, it is based around the idea of an eco-friendly casing that can be easily recycled when the printer is no longer useful. It would also be much less expensive to manufacture, with reduced weight. The clip is somewhat similar in design to the Origami, but its frame is made of sturdy plastic instead of cardboard. Users would still be able to fold the casing flat, but the goal of the design was that is would be completely screw-less, requiring no tools to assemble. This is where the name “Clip” is derived, as it uses a series of clips to hold together. 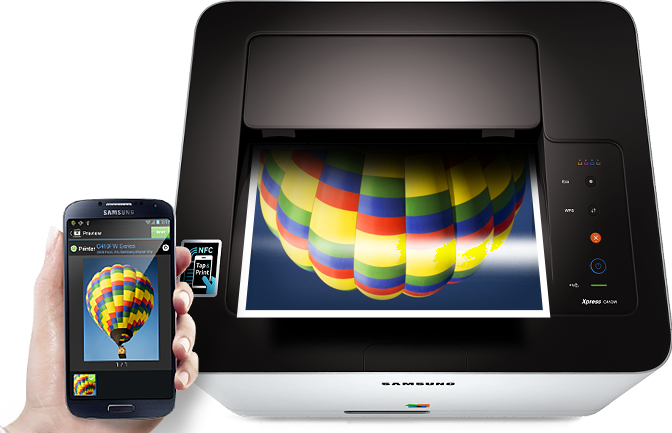 Imagine customizing your printer with new colors when you redecorate a room, and you have the Mate. Samsung designed the Mate with a series of panels on the chassis and paper tray, so that each can be swapped with a new color whenever the mood strikes. While it might be the least exciting of the lineup, the sheer number of color combinations could make the printer a bit more of an artistic feature in a room than an eyesore. While the previous models are still in concept-mode, Samsung also recently released a pair of laser printers with Near-Field Communications (NFC) built right in. The Xpress C410W and Xpress C460W MFP are the first NFC-enabled laser printers to hit the market. 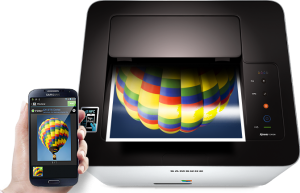 In concept, NFC is used to let devices communicate with each other by proximity, so you can simply tap your device to a point on the printer, and it will begin printing your document or photo. It still requires a specialized app to be installed, but it’s a pretty neat way to print! The Xpress C410W and C460W are both designed for light-duty use in a home or small office, though Samsung plans to release a business model with NFC in early 2014. Both models feature an Eco button to help users save on toner, which is good news, as the Samsung toner cartridges for these models are a bit small in capacity, at only 1,000 to 1,500 pages each. 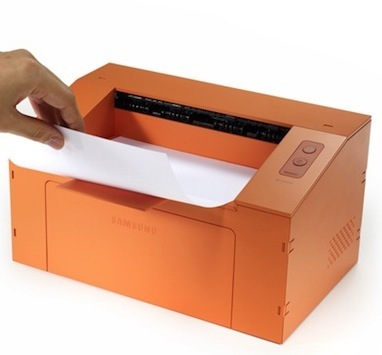 Whether Samsung’s concept printers or their new NFC feature will be particularly appealing to average users, it is good to see the company innovating in design and features. Sure, it’s not as bold as 3D Printing Human Beings, but it’s a start. New concepts in printer design have been few and far between in recent years, so any company willing to think outside the “beige box” should be applauded for their efforts.